I’m aching this morning! A tendon in my ankle is sore, my quads are sore, both IT dnds are, as are both shoulders. Oh, and a knee that is now clicking in an unfamiliar and non too pleasant way. Feel's like I've done more exercise in 48 hours than you have in the last 4 months. As regular readers know, I’ve been sidelined with a stomach injury which has prevented me from running for an unbelievable 4 months. Last weekend was the first time I managed to run for more than 3 miles without stopping. So, it would be fair to say I was somewhat nervous about turning up to the Saunders Lakeland Mountain Marathon on the back of 1 reasonable training run, which itself I really struggled on. The guy that asked me to run with him in the event Mike, was in complete contrast. He may not have ever done any mountain marathons, but he’s in top condition, after running in fell races for the last 6 months and even running a couple of days support with his friend Steve Pyke, who just got the record for scaling all of the Munros (283 Scottish peaks above 3000ft) in 40 days. Needless to say, if Mike had kept pace with Steve Pyke, I knew I was in trouble! Mike had set the bar high and entered us into “Bowfell”. The toughest and longest team-class apart from “Scafell”. I did however provide one useful skill to Mike, I’m a reasonable navigator. It’s a skill I’ve really only learned in the last year. 12 months ago, I’d could have just about told you which way was North on a compass. 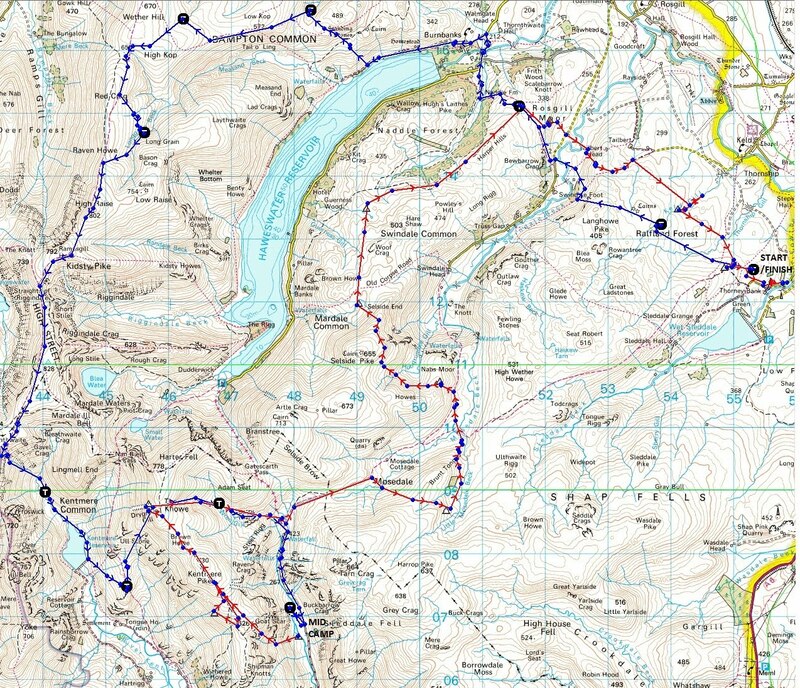 I went on a free navigation course given by a member of the MDS forum, which set me on the road, and then I took part in 2 Mountain Marathon’s last year, my first ones ever. I did, it appeared, have some reasonable talent for map reading. Still it was 8 months since my last event, so I dusted off my compass and this time I had to learn how to plot grid references. I did score classes in the last 2 events, which are clearly marked on the map for you. Here you get a map and a small list of 10 grid references. So, after 15 minutes Googling “how to plot a grid reference I realised it wasn’t too difficult. I downloaded the Saunders 2009 grid references and plotted them on a map to practice. I managed it ok, plotting them all more or less where they should have been. So, I was comfortable I could at least get us from control to control, even if it was going to be at slow pace. All of my equipment is geared up for week-long desert races and I wasn’t about to go buying anything new for this event, since they are not really my primary focus. So, I would make do with what I already had. I do have some OMM waterproofs, which were both required items, and put to good use this weekend as you will read later. I have my desert racing stove, 1 tiny 15g titanium stand that burns hexamine fuel tablets. That was going to have to do. Everyone else seems to use gas stoves on the events. I have a 30l OMM rucksack, which is ideal for a week in the Sahara, with enough room for a week’s worth of food, but way too big for a couple of days in the Lake District. Again, I can’t justify buying a 15 or 20l pack just for this, so my 30l would have to be used. My sleeping bag was fine, the 8C PHD one was perfect. I took my extra small Thermarest sleeping mat, which at 230g is still twice as heavy as the balloon beds favoured by the Mountain Marathoners. I took my Thermarest compressible pillow too, which at 200g is a luxury I’ve learned I need to do any form of camping. The Saunders organisers had emailed us warning a week or teo ago that the Fells were dry, there was little water to be had, and even the river in the mid camp ran out half way down the field. So, scared to death I packed my most unwise item, a 2l platypus water bladder, and filled it to the brim. This of course instantly added 2kg to my pack weight, but I figured it was better than hunting down muddy trickles on bone dry fells. I put in my dehydrated meal, and some snack bars and nuts too. Finally my tent, which I bought for my ill-fated Tenerife expedition 3 years ago (I’ll mention that later). Anyway, I have a 2-man Terra Nova tent, which weighs a kilo and is a tent used by many MM competitors. I gave Mike the tent pole, the pegs, the cooking pot, fuel and lighter to carry, and I carried the main tent itself. I also packed a substantial first aid kit after reading about an accident from the recent LAMM event in Scotland. So half a kilo of survival bag, bandages, and meds went in the pack, as well as the rest of the required clothes and equipment items. My pack weighed in at a thoroughly depressing 7kg. My pack weighed less than this for a week in the Atacama Desert including 3000Kcal of food per day! I knew I was geared up for the wrong sport when I saw the teeny tiny packs that everyone was sporting at the Saunders. Half of the reason I packed as I did was a comfort thing. I’m super comfortable running in deserts, I know what little I can get away with there and survive. I’m like a fish out of water (bad choice of words give the weather it transpired) in the Fells. Bad weather spooks me. Sounds odd right? It didn’t used to, but I got into a lot of trouble trekking alone in a remote mountain forest in Tenerife 3 years ago. Like an idiot I had assumed it was always sunny in Tenerife and didn’t check the weather forecast. There was a category 2 (I think they call it an "orange warning" or something) storm warning broadcast, and I was trekking 60km from the sea level to the tip of a 3750m Volcano at the centre of the Island over 2 days. I wasn’t equipped for more than a light rain shower, got scared, disoriented and lost in cloud in a pine forest on an initial steep 2000M ascent. My scant waterproofing failed, and I got drenched in the heaviest rain I am ever likely to experience in my life, wading steeply uphill through a torrent of water flooding down. I got cold and hypothermia started to set in. It’s a long story (in full here), but I made it to a road and stepped out in front of a car to get rescued by some German tourists. My skin had all turned white, my arms looked like a corpses. They drove me to a hotel where I got help, and effectively saved me in the process. It was that experience that brought me down to earth with a bump. I wasn’t immortal, and Mother Nature commands respect. Since then, I have had a fear of being in remote places in bad weather. Both are those are par for the course in a typical mountain marathon. So, my equipment for these events is my comfort factor. I over-pack because I stand a better chance of surviving. The same applies to my navigation. I think I learned so well, because I trust only myself to get me out of trouble. The other reason I’ve done these few Mountain Marathon’s is to face my fears born out of that Tenerife nightmare, and try and get comfortable with bad weather again. This has been gradually happening. So, Mike turned up at my house at 5:30am on Saturday morning. I didn’t get back from London until late the night before, so there was no way we could go up and camp the night before the event. I drove us up to Wet Sleddale (of “Withnail and I” fame, for those that have seen the movie). They weren’t messing around when they called it “Wet” Sleddale I thought, on the drive home. We got there at 7:15am, registered and then sat in the car for an hour. I had been an avid reader of the MWIS (mountain weather forecast) for the last few days and so (if it were to be believed) we were in for a fine day on Saturday, potentially rain overnight, but clearing a little in the morning but then definitely some rain showers and higher winds later on the Sunday. Almost everyone was in shorts, including Mike, but I opted to run in tights. Less skin to cover with my expensive P20 once-a-day desert sun block I figured. I also ran in my Raidriders adventure top, a long sleeve white shirt that wouldn’t look out of place under a suit. Used to best effect fending off fierce desert sun, and showing signs of too many years of use now . I had my OR Sahara cap and sunglasses to complete the outfit. Oh, almost forgot I had to purchase some Inov8 Mudclaw 270 shoes almost a year ago, as they have rubber studs about 6mm long, and regulations for one of the other MM’s I did required at least 4mm studs. The shoes have however seen better days. They are lightweight, minimal cushioning, no frills fell shoes. After a few events in some grim weather they started to slowly fall apart. Again, I was too cheap to buy any new ones for this event, so I used them, holes and all. The registration for the event had been quick and easy, and we were greeted by friendly staff all weekend. I’ve done two other events in the past, and this one ran like the OMM did, in that the organisation was a well oiled machine, and things ran smoothly and well. At 8:20 we wandered up to the start, where two nice ladies were handing out free sunblock. I had a bit extra to cover my delicate little ears! We got out maps and ten minutes or so later, we got our list of controls and were off. We walked 20m from the start and like everyone else sat down to plot grid references. We decided just to plot the first few before setting off. Below is the map. The blue line is day 1 and shows the approximate route we took between the controls (black circles). The red line is day 2, and the small triangles are the controls on that day. You can view a bigger version of this map here. We set off walking up a wall and then we set our first bearing for a control near a small waterfall, some 2km away. We were still at low altitude, around 300m, and the terrain was tussocky and slow. It seemed to be somewhat wetter underfoot than I was expecting too? Not too much drama hitting the first Control. We hit the gill (a small river), and just headed upstream 30 or 40m to find the control. It was nice to get the first one bagged ok. The next control was about 2.5km away again, and up over a hill, into a valley then up a reasonably easy climb. We had to navigate between two out of bound areas. If anything we went slightly to the left of where I wanted to come out, but a few minutes lost if any at all, as we hit a good path and then hand-railed along a wall to cross the a river and road in the valley. So, feet wet early on, and they would stay like that for 2 days. We joined a snake of people climbing up a hill, all doing various courses, but happened to be headed the same way for once. We found the control and then had to follow a taped route down and around a farm at Burbanks head the East end of Haweswater. At the end of the taped route we had our first navigation decision. 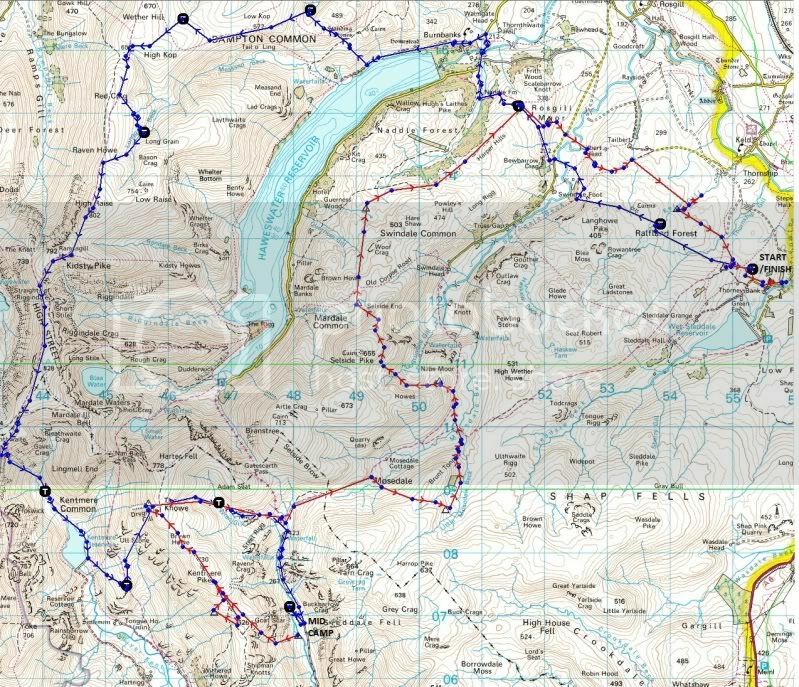 Head diagonally up hill for 2km or run along a good wide path along side Haweswater until we were closer to the control and then head more steeply up a gill-side for a 200m elevation gain to take us up to 450m. We opted for the latter, so we ran along at a good pace before then heading slowly up through a bracken covered hillside to the left of Four Stones Hill and then up further to the 454m trig. At this stage I set my altimeter to 454M too. I had bought a cheap (£20) altimeter from ebay, the one expense I made for the event, reasoning it was a safety device, and it appeared all of the more experienced teams used them. From the trig I saw the control a ¼ of a km below and we headed down and Mike tagged it. We then headed West, joining a path and climbing up to 600m. I kept an eye on the altimeter and at 600m we took a bearing straight for the next control, which was also around 6oom. We joined the ravine slightly too low, as the control was at the bottom of it, and so we had to head up about 50m to find it. All fairly painless, and no time lost really. We next had to had to either bear straight for the next control which would have meant a descent, then ascent up a gill, or head up Wether hill along a good path, contouring around some re-entrants before coming at the control from above. Again we took option two, but we didn’t quite stay on the good path for long enough and had to dip in and out of a couple of small ravines to hit the control. Slightly finer navigation would probably have saved us a few minutes, but I’m learning all the time. We plotted the next few controls here, and were a little dismayed that it was about 7km to the next control. We were at 600m in height and faced a pretty horrible and fairly steep climb up 200m to regain the main path and take us up to the top of the mountain “High Raise” at 802M. We then ran down slightly before heading back up to Rampsgill Head then down and up to the highest point of the weekend 828M peak “High Street”. The high pressure and glorious weather gave panoramic views of the fells 360 degrees in every direction. Sadly I have no photos. I use my iphone as a camera normally, and phones with GPS are banned from the event so I left it in the car. At High Street a couple of other guys doing Bowfell asked if we had any local knowledge and which would the best way to descend to the next control. Neither me or Mike had ever been here but I offered my opinion as to descend East, starting in the saddle between Thornthwaite Crag and Froswick peaks (by Over Cove). I reasoned there looked to be less scree slopes. It was a steep descent anyway, losing 500m in ¾ of a km. The other option would have been to go via Mardale Ill Bell, which we did see others heading towards. Everyone decided to go with my option which turned out to be pretty good I think. My hill climbing fitness was already showing up to be shockingly poor now , but my descent skills are pretty good. I lead, running down through the short screen slope and then bounding down the grassier slopes below. I assumed everyone was close behind, but glanced back and Mike was more than 100m away, and the other two guys twice as far. Oops. Lesson learned, pay more attention when descending. You should always stay close to your partner in these events. Because me and Mike have only run together a couple of times we don’t really know each others ability of various terrains. I can descend very fast, and Mike can climb very fast! Personally, I’m more envious of Mike's skill! Mike caught up and we continued down. I kept glancing back, but once too often as my foot hit a pot-hole on the steep slope descent and it caused my toe to point up and buckle by knee inwards, the opposite direction to the way it should bend. It made some horrible crunches and noises. I dropped to the ground in pain and sat there hugging my knee, genuinely worried as to what I had done. Mike is a physio and said worst case was you could damage your ACL that way. Best case was that it was a Patellar tendon strain. He said if it was ACL it would swell it within 12 hours and I wouldn’t be able to put much pressure on it. It really did hurt, right under my kneecap, but adrenaline was fuelling me so I carried on, taking it a little steadier. We got to the next control in a large sheepfold near Kentmere Reservoir. We then headed alongside the reservoir itself and took a bearing diagonally South East up to “The Tongue”. I was beginning to struggle at this point. My knee was obviously hurting, as was my stomach injury. However, I had also neglected to take on much fuel so far, and we were already ¾ of the way through the day. I had drunk plenty of water but only had a couple of chewy bars and was running close to empty. I was feeling slightly shaky, usually a good indicator of low blood sugar. The lack of training in the last 4 months, of course meant no hill climbing either so I was really suffering on steep ascents and Mike was frequently having to stop and wait for me. I was seriously slowing him down on the hill climbing. When we got to the next control, between two knolls, I had to sit down and take 5. I knew I had to force down some calories as I could see the next and final horror climb between Kentmere Pike and Harter Fell. I ate 500 kcals worth of honey roast cashew nuts, upped my water intake. Past experience on long events has taught me that when you feel rough, up your food and water and that fixes most things. There were a good few teams around at that time and many were taking the most direct line to the control in the next control which involved dropping 100m and then gaining 430M up a nasty craggy side of Kentmere Pike. Knowing full well, I was ascending so poorly on the steeper hills I suggested we contour around to the North maintaining our current height and then tacking a less steep ascent up to “The Knowe” just below Harter Fell. This was still to be a 350m gain and slightly longer, but better in my mind than the more direct option given my current condition. The climb still proved torturous. I was just slow, plain and simple. My cardio fitness was there, but my leg strength has been lost in the wilderness last 4 months. I was frequently stopping and turning around to drain the lactic acid from my legs, and then climbing more and repeating. We headed diagonally up skirting Drygrove Gill where other competitors were tagging a control on the course there were doing. It proved a useful spot as it was a control for us on day 2. After what seemed like, and probably was not far off one hour, we got to the top of The Knowe and dropped down off East side of Harter Fell. It was another fairly steep descent, tough on the quad muscles at this point, and my knee was complaining about it as well. I took the descent slightly easier but still a respectable pace, keeping pace with a solo competitor running on the opposite side of a gill from us. We tagged the control and 550M and then followed the gill down to a hard stone footpath which we ran down quite quickly. The path was enclosed, out of bounds either side and we ended up going almost right to the finish, and running through the camp, doubling back to get the final control and then running back the finish. I don’t think everyone was so conscientious of the out of bounds mark and headed through an earlier gate, probably saving 5 minutes but still we followed the route and were happy. We crossed the line in 6:49 I think. In 32nd position. 61 teams were registered to start the event, I guess about 55 actually started, but I’m not certain as the final results don’t show all the teams who withdrew (I know this because I know one team that did withdraw and there results are not on the list). Mike bought me a can of Coke from the finish, and some milk for his cereal. They told him they had sold out of beer. Seems a little poor that the teams doing the shorter courses get to buy all the beer when they finish earlier in the day; presumably they set no limit per person. That’s one small jibe at the otherwise faultless organisation. I don’t drink anyway, but Mike would have bought some. We set up the tent and filled up our water from the stream. Mike had been refilling his bottles all day, whereas I had just about got by on the 2l water I filled from home. There has been plenty of water in the streams on the fells and the mid camp river was flowing well. I assume there had been lots of rain because the scare stories of dry fells didn’t feature at all. I could have got away with stream refills and saved myself a couple of kilos in weight. I took a 600Mg Ibuprofen for my knee. Mike looked at it and thinks it will be ok. It is likely to hurt for a couple of weeks I think, but hopefully no serious damage done. Mike spotted a couple of his friends who it transpired I had met on a Bob-Graham round support a couple of years ago, and we had a chat about the day and complained about that last hill! It got quite chilly in the evening and I had my waterproof jacket on for warmth as well as my fleece and hat. We ate around 5:30pm, enjoying some of my awesome Mountain House meals. I import the 'meals for two' (which are meals for 'one' hungry runner) from the States, as the Mountain House selection sold in the UK is very limited indeed and doesn’t have the decent portion sizes or choice. Hilariously I managed to burn a hole on one of my socks, as well as adding another hole to my already fairly holy fell shoes, putting them a little too close to the stove. Lucky I wear two pairs of socks, so I was ok for day 2. We got off to sleep about 9pm, and both slept intermittently all night, as you do when camping. I slept well enough to feel rested, but woke to intermitted rain drops and higher winds. We popped out heads of the tent to see the clagg (low cloud) was down to about 400M, much as the weather forecast had predicted. Visibility above 400m (and later on much lower) was going to be poor. We had breakfast and some coffee. I took another 600mg ibuprofen before the start and we headed to the start line, collected the grid references and plotted them all. We would face another 400M steep climb over ¾ km up Shipman Knotts straight away. We cleared the start and it started to rain immediately. We were already in our full waterproofs anyway. I hoped I would be ok with a climb so early in the day but I began to feel pretty sick about half way up. The train of people climbing split into two, and I remember earlier thinking we needed to stay left, but the right fork looked an easier climb and there wasn’t much difference in where they bought you out, about 150m apart. I climbed really quite slowly, Mike frequently having to stop and slow up. I was feeling really nauseous and the wind and rain just compounded the miserable feeling. By the time I got to the top I was almost on auto pilot and was just following a train of people along a wall. I took a bearing and it was right and carried out. I had to stop for a few mins, as I genuinely thought I was going to be sick and wondered how wise an idea it was to start the day in such a poor state. Still I carried on but something was wrong. We were heading upwards and the wall we should have been following was along one contour line (no elevation gain). I checked the bearing again, it was the right one, so we carried on. I stopped twice more and then remembered I had an altimeter, and it showed we were way to high. I studied the map and saw that there were two walls running parallel to each other, one lower down the hill. It was hard to spot under out of bounds marker lines, but I had missed it and we were 150m metres higher than we should be, as well as further North. I have to carry the can for the nav mistake, as I was doing the main navigation. We backtracked and cut down to the right wall, then carried on along it until we found the control. We then had to trudge back up that same 150m height gain to join the path we had left 30 mins earlier. So, half an hour lost due to my slightly poor mental state after feeling sick. Still, the nausea had by now improved even though the weather had deteriorated. I was expecting showers all day, some heavy, and high winds but certainly not as rough and persistant as it turned out. For the whole day there onwards it was heavy rain and at times gale force winds on the tops. The cloud dropped lower, so we were in cloud for the whole day with visibility down to less than 100m for the most part. This is the weather that shows the men from the boys in navigational terms. I had just been shown to be one of the boys with that early error. The sickness was a factor though,quite possibly bought on by the big dose of ibuprofen. I just wasn't paying enough attention. After that early major nav mistake my nav was pretty sharp until a couple of smaller errors near the end, despite the awful weather. You do question what the hell you are doing with your Sunday getting lashed by sideways rain and high winds when most sane people and reading the Sunday papers indoors. Me and Mike did however retain our sense of humour all day, as did pretty much everyone we met on the hills. We did see quite a lot of teams heading back down due to the weather, and the results at the end of the day showed at least 10 more teams in our class alone had thrown in the towel on day 2. They were probably the sensible ones! We headed up and over Kentmere Pike and then to the control that we had passed on day 1, in Drygrove Gill, which it transpired was a control on our course today. It didn’t really make it any easier to find though as we spotted it when we were about 10 metres from it, as the cloud was so thick. A few teams were huddled in the small ravine getting some shelter and putting on more clothes or waterproofs. We saw a good few people who just wore shorts all day long. Obviously hardier men and women than us, in our full water proofs. The next control was 5km away, the first 2.5km of which we had travelled in the previous day. A sharp descent down Harter Fell and then run along the stream to the stone Path near yesterdays finish. I had hoped we would emerge from the cloud as we lost height but we only got as low as 400m and it was of course still there. We knew we had lost a lot of time with that nav error and so took a slightly riskier route to the next control, a sheepfold off a spur called Brunt Tongue. We timed our pace and walked up the path, crossing a stile and them timed the next 1km to around 425m height. We then took a bearing from where we thought we should be by then, up over Brunt Tongue at 500m and down to the sheepfold. We definitely made up a little time here as other teams had played a slightly longer safe option of staying on the path for longer. I don’t think we made up much, maybe 10 mins. 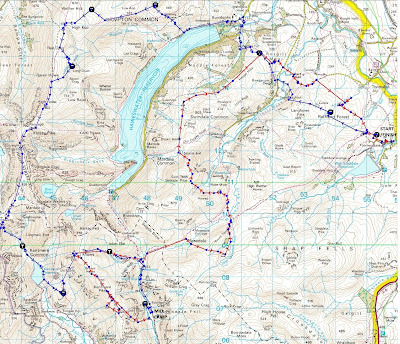 We hit the sheepfold spot on, tagged it and then ran down a well trodden path through marsh and bracken to a bridge by Mosedale Beck at 410m and then along a good path before a steep ascent up to a small tarn at “Howes” at 510m. The weather was turning worse; heavier rain and the higher wind. It was now very windy indeed on the tops and a fair amount of “lean in” was required at times . We had resigned ourselves to being rained on and blown about all day. Once you resign yourself to that, mentally, the task becomes easier. My OMM jacket did a great job, kept me dry all day. OMM waterproof trousers didn't. They failed after an hour or two. They seemed to soak up rain like a sponge. When I took them off I swear I could have got half a litre of water or more out of them. I was a bit surprised at that, since you'd have expectedt better from the brand. It was at this stage I realised I was coping fine with the bad weather, and the Tenerife demons had not come back to haunt me. Maybe I’ve turned a corner here. Sure, the weather could have been worse, though standing on the tops it felt pretty rough. It was only 1.5km to the next control, but it needed some good navigation. I seemed to find myself at the head of a group of about 4 other teams who were clearly also after the same control, whether they be on our course or not. Again, we opted to stay high and not follow some others into a valley, just to climb back out of it. We contoured around, both or our ankles complaining bitterly about it. The other teams behind must have agreed with my, since they were following us. I cling onto the hope that my navigation decisions were half reasonable this weekend. There was a tough steep climb up Selside Pike (655m) just skimming to the right of the peak and walking above some crags to our right. Upon reaching that top the gale force wind blew so hard that I actually dropped and flattened on the ground. We were quite close to a big drop to the right, and it wouldn’t take much more blow me right off. I got back up and leant hard into the wind staying low until we cleared the top and the highest winds, and dropped into the valley beneath where I spotted the control near the cheerfully named “Old Corpse Road”. I was now feeling strangely good. I had picked up the pace. Maybe my endurance was waking back up at. In normal ultra races I tend to start to improve at the 20 miles mark. Today, my “ups” seemed to coincide with Mikes “downs”, and vice versa. We’ll have to work on synchronising them! We set a bearing for the next control with two other teams following and headed over marsh and knolly ground for 1.5km. I impressed myself at walked on compass right to the next control within 5m. The guys behind caught up and said I hope you don’t mind us following you still. I said I didn’t mind at all and we all headed off on the next 3km leg, mostly following a wall to get back to cross path from day 1. From the path crossing we took a bearing to head for a crag top, but ended up about 150m to the right on another crag top. I looked at the compass but reasoned it had to be the other crag. We headed across and the other team with moved off ahead and us waved us to say it was there. I’d just drawn the grid reference slightly too far south and picked the wrong crag, but no harm done there as we had to pass the other crag to get to the footpath down to cross the road in Swindale, much as we had near the start of day 1. One of the other teams had initially run off ahead, and then stopped to check maps and fallen behind. We didn’t see them again. We were now still in a group of 4 just to close down these last 2 CP’s. The last climb of the day, a 170m pull up to near Talibert Head was completed, everyone feeling it by now, even Mike I think. We followed a wall around a farm and I took a bearing off a wall corner straight to the control which was listed as “a boulder” by a stream. I learned a lesson for another time here. I should have aimed upstream, and not straight to the control. Heading downhill on a contour I must have drifted downhill by 100m. As we approached the stream we saw other teams heading towards a control 200m further downstream. The other guys started heading that way and I said that can’t be it. The compass “says no” and there is not a boulder there. They seemed convinced and I was swayed by the masses but stated, I am sure it is the wrong control. I was right. Got there and it was not the one we were after, so we spent another 5 mins trudging back upstream to find the right one. I noted we were not the only ones to make the same mistake as a team ahead of us had done the same. I figured another 10 minutes lost there. Even so, one last control left, a little more than 1km away , albeit over the same tussocky marshland from the previous day. We were all pretty tired by now, and again we started to drift downhill as we headed towards the control, very easy to do I think. One guy from the other team was ahead at this stage and I shouted him back as I spotted the last control about 200m above us. We all headed up there tagged the last one, and all jogged gently down the hill and into the finish another 1km away. The finish was in a large marquee fitted out with tables and chairs. Some food was provided, which was hastily scoffed down and well received. A big thank you for the organisers for doing such a great job this weekend and always being happy and cheerful. I know events organisation is very challenging and to do it well, and still retain a sense of humour is even tougher. Well done SLMM. We had dropped 4 places overall and finished 36th overall. The car park was almost empty, the shorter courses would all have come in earlier and some teams from all classes had quit I guess. In fact only 40 teams from our class finished at all! I drove us home and later plotted the routes you see from that map. We covered 19.5 miles with 5500ft of ascent on day 1, and 17.5 miles and 4950ft of ascent on day 2. Two tough days in the mountains, day 2 made more challenging by the weather. It was a good learning experience for us both, but really showed up just how the 4 months running hiatus has hit my ability. Today I ache, as I mentioned but my stomach is ok. I think that is due to the lack of running on day 2, and not a miracle cure. I need to get some answers to what is causing the pain and get back on the path to full fitness again. My knee is clicking a lot, which isn't nice. Not sure what's going on there, but I hope it fixes itself soon. Mike enjoyed his first mountain marathon and I’m sure will do more in the future. I can only apologise to him for being so out of condition and slowing him down this time. He may well do the Rab or the OMM later in year. He’ll need another partner for those though. Dark and White events banned me from their events (they run the Rab) after I heavily criticised the organisation of last year’s event in a blog post on here. I subsequently removed the post so they would allow Mike to compete in their events, even though I would stay banned. Personally, I think you should take a bad review on the chin, admit the faults, and do better next time! It’s the only event in 5 years of doing events all over the world I have ever had so many issues with. I’m quite certain they’ll sort out the problems from last year and run a smooth event in 2010. SLMM and the OMM both ran like clockwork. One final note. I mentioned in my previous post that I had half a dozen friends doing Racing The Planets Gobi March (I plan to take part next year); this year in the Turpin Basin in China. I got back last night and checked the final results to read that every single one of them had completed and in some style. Christian Sheister (who I shared a tent with in the Atacama 2009) came 2nd overall! The rest of the people I know from Racing The Planet events too; Lucy, Sam F, Sam G, Diego and Tremaine all finished well. Some of them are doing all 4 RTP deserts this year, so the best of luck to them! One sad note though, a couple of friends have posted updates and blog posts to say a 31 year old US male competitor who collapsed on day 4, died a couple of days later in hospital. I don’t know any details, but we all push ourselves to and beyond our limits in these desert events, and this is a reminder of how dangerous they (and in fact any endurance events) can be. My thoughts go out to his family and friends at this sad time. Like the new blog look. Thanks Andrew. I'll be limping for a week or so, but I hope this knee isn't too much to worry about. The blog looks a bit cleaner and there is a wider area for the text, so less scrolling. I might not be running this week, but ever the optimist I entered another event which I'll post about next week. Hi Rich- well done, hope your injuries are ok now. What event are you doing this weekend? I've not got any events planned at the moment. See how this knee clears up. It's very clicky and sore right now. I'd normally have done the Harden Hard 'un this weekend, but just not possible after last weeks knee mishap. Friend of mine wants me to do a 15 mile Gritstone race in a couple of weeks, or at least train somewhere in the Peak District with him. All depends how this knee holds out. The evtn I've entered is next year, i'll post some details after the weekend.